Think Florida and Disney World or the beaches of Tampa and Miami may come to mind. But do you think of Mermaids? Live ones, swimming underwater for your entertainment pleasure? Florida has more than 160 state parks. Many are in spectacular settings and worth a visit particularly if you are in an RV or camping. Three of these parks, all fairly close to each other on the west coast, about an hour north of Tampa, used to be popular tourist attractions that the state took over in order to protect their natural beauty. 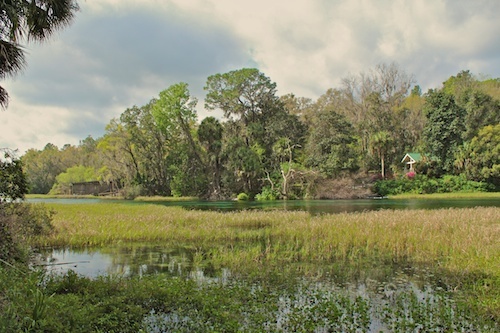 All are also centered around three of Florida’s natural springs and rivers. Why fight the crowds at Florida’s big attractions when there is so much else available off the beaten path? Weeki Wachee in Brooksville, Florida has the mermaids. They have been putting on shows since 1947 when some entrepreneur cleared the refrigerators and other trash out of the spring, build a small amphitheater, hired some good looking women and started the underwater mermaid show. It’s still going. They’ve added river boat tours, a sand beach and water slides since then, but the mermaids carry on. The photo is from their website, since I didn’t have one of my own. If kitschy entertainment is your thing, this is the place for you. Homosassa WIldlife Park is 30 minutes farther north. This used to be an exotic animal park. When the state took it over they transformed it into an exhibit of native Florida bird and wildlife. 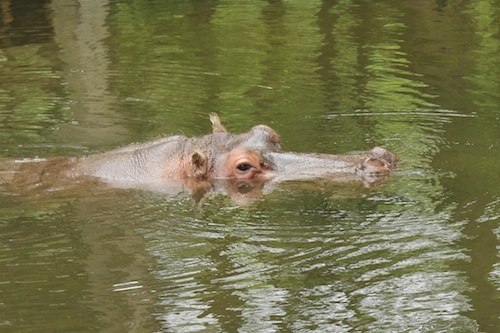 The only remnant of the exotic days is Lu the Hippo. (It was Lucifer, but the PC police in Florida apparently thought that name too “devilish.”) The state was going to transfer Lu, but he’d been there for 50 years and was a local favorite, so he got a reprieve. This park is a favorite spot to visit. The Fish Bowl allows underwater views of the resident Manatees and the thousands of fish that gather at the Spring. It pumps out 600 million gallons of 72° water a day and forms the Homosassa River. 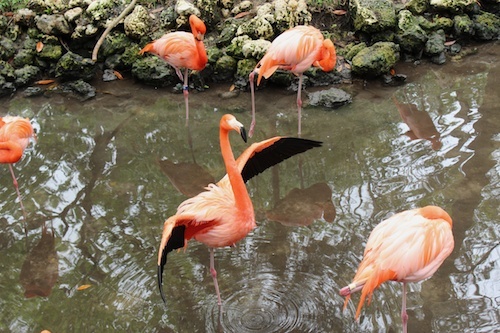 Most of the birds and animals are rescued or in rehabilitation. It’s a special place to spend a leisurely afternoon. 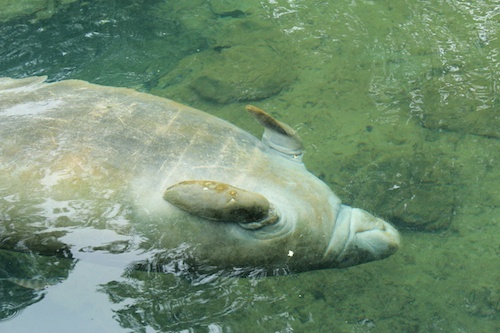 If you really get into the Manatees, an easy thing to do, there are local tours that will take you out into the rivers and springs to swim with them. Rainbow Springs State Park is another 40 minutes north in Dunellon. It used to be called Blue Spring and like the others it was a tourist attraction offering glass bottom boat and submarine tours. That all ended in the 1970’s. Today there are no animals, no mermaids, no kitch. 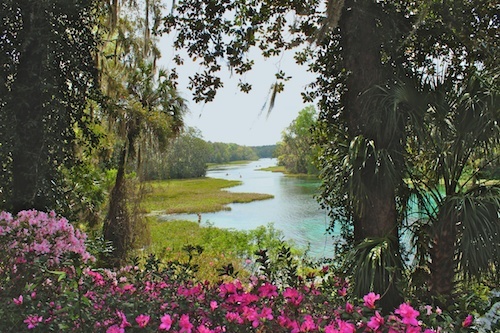 All you get is a beautiful spring, flowing into the Rainbow River, a few waterfalls and azaleas, lots of azaleas. Early Spring is the time to visit. 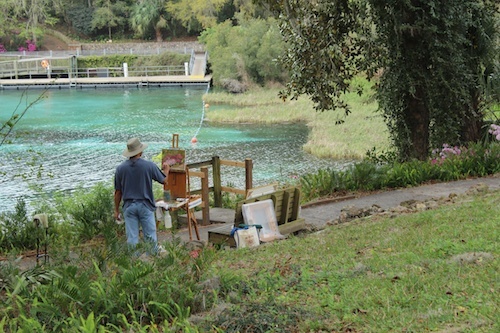 The azaleas are in bloom, the waterfalls are flowing and the artists are plein airing. Kayaking, tubing and swimming are allowed. What more do you need but to enjoy the view and plan a way to get down to the Nature Coast of Florida and see what we love about this area of Florida..
LOVE, LOVE, LOVE this post. I have been to all three parks, but it has been years. The reason I started my blog was to push me to re-explore my homestate. Thank you for posting this. I am going to share it on my blog, once I figure out how. Thank you so much, and thanks for the reblog. We spend a lot of time in Florida when not on the road so I also try to do my exploring of the state. Will follow you for some new ideas. This is one of the many, many reasons I love my Florida! Manatees, such gentle creatures! Be well and safe travels. I’m not surprised the mermaid show still runs. Children (espcially girls. it seems) are genetically programmed to *love* mermaids. I’m sure you are not the first, nor will you be the last, to LOL at one of Florida’s more cultural attractions.